From Canada. Quartermaster's Depot appears to be out of business. They also produced a line of decals. 72001 WW II Allied Posters Printed on paper stock. 72002 WW II Axis Posters Printed on paper stock. 72003 WW II and Modern Maps Printed on paper stock. 72004 Firing Range Targets Printed on paper stock. 72023 Canadian Road Signs Printed on paper stock. 72005 Canadian Leopards & Beavers Complete markings for three Leopard C1s, one Leopard C2, and two Beaver bridgelayers. 72006 Canadian Shermans #1 Complete markings for four Canadian Shermans in WW II. 72007 Canadian Shermans #2 Complete markings for four Canadian Shermans in WW II. 72008 Canadian Shermans #3 Complete markings for four Canadian Shermans in Korea. 72009 Canadian Shermans #4 Complete markings for four Canadian Shermans in WW II. 72010 Warsaw Pact T-54/55s #1 Complete markings for five tanks. 72011 Warsaw Pact T-54/55s #2 Complete markings for five tanks. 72014 Canadian Shermans #5 Complete markings for four Canadian Shermans in WW II. 72015 Canadian Shermans #6 Complete markings for four Canadian Shermans in WW II. 72016 Canadians in Britain #1 Complete markings for Four vehicles: Grant, Lee, Stuart and Artillery Tractor. 72017 Canadians in Britain #2 Complete markings for Four vehicles: Sherman, Lee, Churchill and Artillery Tractor. 72018 Canadians in Normandy #1 Complete markings for two Shermans, a Priest and a Universal Carrier. 72019 Canadian Achilles and Stuart Complete markings for two Achilles and two Stuart Recee's. 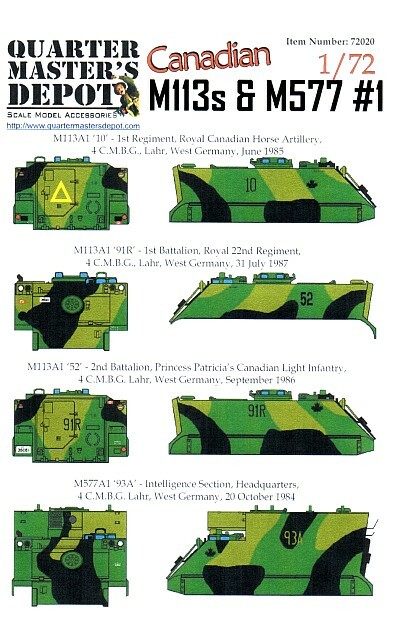 72021 Canadian M113s and M577s #2 Complete markings for three M113s and one M577. 72022 Canadian Centurions in West Germany Complete markings for four Centurions.